Almost ready for Thanksgiving and Christmas? They're almost here! And, we hope you won't miss out on some of Hank's best adventures!! 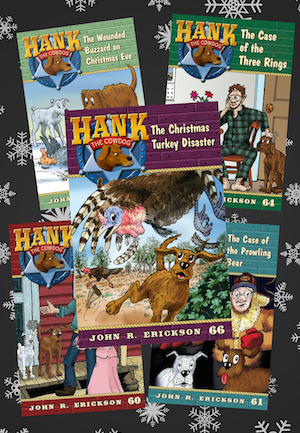 There's the classic favorite, "The Wounded Buzzard on Christmas Eve" (Hank #13) in which Hank and Drover help Slim rescue a VERY ungrateful, half-crazy Wallace the Buzzard, but did you know Hank has had even more holiday-season fun in recent years?? There's "The Case of the Prowling Bear", "The Big Question", "The Case of the Three Rings", and, most recently, "The Christmas Turkey Disaster"! Well, what’s a dog to say? We try to do our jobs. We stay up late, after everyone else has gone to bed. We do patrols, make reports, work in weather that isn’t fit for man nor beets. We monitor the activities of crinimals and spies and postal employees. We study the clues and build our cases, and what do we get? They tell us to hush, and slam the door in our face. In many ways, this is a lousy job. You know what I should have done? I should have quit, resigned my commission, pitched them my badge and walked off the job. That’s what ninety-nine percent of the dogs in this world would have done. But you know me. Cowdogs have to be just a little bit special. When the others quit and go to the house, we’re still out there, protecting the ranch. It doesn’t make sense and I can’t explain it. That’s just the way we’re made. So I guess you’ve already figured it out. I wasn’t ready to quit the case. Too much was at steak…uh, at stake, we should say. Above all, I had to consider my relationship with Sally May. Lately, things had gotten better between us, and you might recall that upon her return from town, she had noticed my restrained, gentlemanly behavior. That was a very positive sign and you can’t imagine how long it had taken us to reach this point in our bonding process, after years of misunderstandings and faulty communication so-forths. Things were better now, and I just couldn’t throw it all away. But this case was complex because it involved HER SCHEMING LITTLE CAT. Everyone on the ranch seemed to think that he was Mister Kitty Perfect, that he never did anything wrong or even had a naughty thought. Oh yeah? Well, this incident in the car was fixing to blow that theory right out of the water. I had the goods on kitty and, this time, no amount of treachery and lies could get him off the hook. I had Pete exactly where he wanted me. I loosened up the enormous muscles in my shoulders, lifted my head to the angle of maximum sternness, and began a fateful march toward the car. This time, there would be no Drover to chicken out, and there would be no fair warnings for the cat. We had worked up a simple Tactical Response: wade in, take no prisoners, and accept whatever wounds and casualties were required to clean out the thieves. Kitty might land a few lucky punches, but in the end, brute force would win the day. At the open door of our Beloved Ranch Wife’s car, I paused long enough to take one last snapshot of the crime scene. Kitty was so absorbed in vandalizing the family’s bread supply, he didn’t notice me. Good. The Weapon was armed and ready. Three, two, one! Bonzai! Beautiful. Kitty never saw me coming, had no idea what hit him. He went off like a sack full of mousetraps, jumped straight up, hit the ceiling, bounced off a window, and—best of all—vanished without a trace, and we’re talking about a blind retreat out the car door. Hey, we’d gone into this mission expecting to lose some skin or a piece of ear, but kitty was so shocked, he didn’t land a single punch. I mean, we had cleaned his clock. Okay, one punch, and it was the weirdest thing you ever saw. One of his stupid claws sank so deep into my upper lip that he couldn’t get it out, and for several tense moments, we were, well, sort of welded together. I told you this was weird. For fifteen seconds, we stopped the war and worked together on getting his claw unhooked from my lip. At last, we got it out and I did what any normal, healthy American dog would have done. I gave him our Train Horns Barking Application, right in the face. Hee hee. You should have seen him! He turned wrong-side out, bounced off the ceiling, and went flying out the door. Sniff sniff. What was that? Bread, but also something else. Sniff sniff. Very interesting smell. Hmmmmm. That smell wasn’t coming from the bread bag. It was some kind of meat. Anyway, we laid out a grid and activated Snifforadar and began the tedious process of walking the instrument back and forth across the…WOW! Anyway, nothing much happened. It was just a normal, routine wrap-up of a normal, routine crime scene investigation. We collected evidence, made some notes, dusted for footprints, the usual stuff. You know, a lot of people and dogs think that Security Work is glamorous and exciting, but the truth is that it’s just like any other job, mostly routine. Lots of reports and paperwork. Sometimes it gets a little boring, so we needn’t go over every little turkey. Every little detail, let us say. It was pretty muchly an open and shut case, in other words. We’d caught the cat in the act of robbing bread in the back of Sally May’s car. For evidence, we had the plundered bread bag and cat tracks all over the scene, and all that remained was for Turkey May to haul the little thief into court and give him three swats with her broom. I would have loved to be there to watch the cat receive the thrashing he so richly deserved, but I, uh, had another appointment and needed to move along. I dived out of the…that is, I stepped out of the car and raced…I walked up the hill to the machine shed at a leisurely pace, whistling a little tune and, you know, enjoying the crisp cold air. As I approached the machine shed, it occurred to me that Drover had fled to this very place (remember?) and that, well, he might need some counseling. He has a lot of problems, don’t you see, and…well, if a guy ever gets too busy to help out a friend, he’s just too turkey. Too busy. He’s too busy. So I, uh, slipped through the crack between the big sliding doors and went inside. It was dark in there, but I knew where to find him. He’s such a funny little guy, afraid of everything, and when he wants to escape Life Itself, he crawls into the darkest, backest part of the machine shed. He sprinted to the door and dived outside, leaving me all alone with my, uh, problem. You’re probably curious to know about my problem, but I’m not going to tell you. Sorry, I can’t. You know how I am about the little children. There are certain parts of my work that we just can’t reveal to them, and that’s all I can say. Chapter 6: Who Did It? Oh, I know what you’re thinking. “Go ahead, tell the truth, let it all hang out.” It’s not that simple. Listen, we’re not talking about some little slip-up or a tiny lapse in judgment. This is…this is really dark stuff. I can’t do it, sorry. So there I was in Drover’s Secret Sanctuary and our story is stuck on high-center. Anyone know a good joke? Wait, here’s an idea. What if we played the transcript of a conversation that would, uh, explain a few things? I don’t have to admit anything, see, and you can listen to it and make your own judgment about whether it’s true or just a pack of lies. This might work. Okay, stand by to roll tape. Sally May: “Alfred, I thought I told you to bring in the groceries. [Footsteps moving toward the car]. Wondering if Hank's reputation survives, or if he really has ruined Christmas dinner on the ranch?? Believe it or not, that's not the only trouble he gets into that day! Check out "The Christmas Turkey Disaster" to read the rest! And, as always, we love hearing from you! Be sure to leave a comment to let us know what you think!